I have been a bit quiet on the food front lately, because I haven’t really been eating much but rice. Bit of a tummy bug. 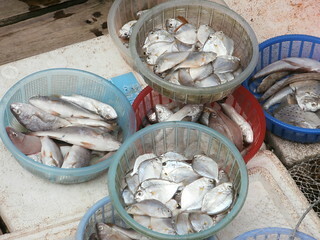 But today I am back in the game and just in time for a seafood lunch on board our cruise through Ha Long Bay. Fish, Prawns, crab, squid and some spring rolls. The fish is so fresh and the prawns are delicious when steamed. The crab was a bit strong for me in flavour, but the way they present it is great, in the shell with a mix of spices and a fried crust on top. Not sure if our fish was purchased here, before we set off, but it most definitely would have been bought fresh and alive. When you wander past the local restaraunts in town each have tanks out the front with the seafood so you can be sure it was swimming not more than ten minutes before you eat it. Rod Rolfe and I would like an update on the Chicken Satay options that you may have on your trip. Simon can explain the background to this request from us. I haven’t seen any Satay Chicken options on the menus as yet John. But then I haven’t really seen many menus as our guide has ordered all our meals. If I don’t find any soon I’ll get you to put an advance order in for me at the bowlo for when I get back. Next Next post: Do they make the summit?